Score of my concertos, engraved by Signor Ricciotti. These concertos were composed at different times between 1725 and 1740. When they were ready, I took them along to the musical gathering organized in The Hague by Mr Bentinck, myself and some foreign gentlemen. Ricciotti played the first violin. Afterwards I allowed him to make a copy of the concertos. When all six were ready, he asked permission to have the engraved. Upon my refusal he enlisted the aid of Mr Bentinck, to whose strong representations I finally acquiesced, on condition that my name did not appear anywhere on the copy and that he put his name to it, as he did. Mr Bentinck wanted to dedicate them to me; I refused absolutely, after which he told Ricciotti to dedicate them to him. In this way these concertos were published against my wishes. Some of them are tolerable, some middling, others wretched. Had they not been published, I would perhaps have corrected the mistakes in them, but other business has left me no leisure to amuse myself with them, and I would have caused their editor offence. In 1980 the Dutch musicologist Alfred Dunning was exploring the palace library at Twickel in the Netherlands. Here he discovered the scores for six concertos, with the foreword by the composer quoted in full above, which answered the two questions which had long puzzled musicologists: who had composed these concertos, and why had the composer not identified himself. Indeed the foreword revealed that the composer had deliberately concealed his identity. Dunning's researches are documented in his publication Count Unico Wilhelm van Wassenaer. A master unmasked, or the Pergolesi-Ricciotti puzzle solved. (Buren,1980). After years of mis-attribution, first to the Italian publisher/violinist Ricciotti, then later to Pergolesi, of the Six Concerti Armonici, the true identity of the composer was thus established beyond doubt, together with the probable reason for the anonymity and resultant confusion - simple modesty on the part of the author! The Van Wassenaers were, and indeed are among the most distinguished families in the Netherlands, tracing their ancestry continuously back to 1200. The family had originally belonged to the country nobility, rising to power and influence during the Dutch rebellion against Spain from 1568-1648. Thus Unico Willem was born, on November 2nd, 1692 in Delden (Netherlands), into a family of generals, admirals and personages holding high positions in the government of the Dutch Republic, gaining more and more wealth through marriage and their own influential positions. His father was a general and later held diplomatic positions at different courts in Germany, where luxury and the arts flourished. He sometimes took his sons with him and no doubt they were influenced and inspired by their experiences. An early period of residence at Düsseldorf and a "grand tour" of Germany, France and possibly Italy (1717-18) provided the young Unico Willem with musical stimulus. He had also been a pupil of the then-famous Quirinus van Blankenburg; other members of the Van Wassenaer family also took lessons from this 'clavecymbel-meester' (cembalo teacher). "Unico Willem and his older brother Johan Hendrik had an aunt, their father's sister Agnes, who helped raise them in the beginning after their mother's death. Agnes was a very artistic person, who painted, made music and was a great gardener. Her best friend was Mary Stuart II. In winter the family lived in The Hague in a beautiful house in the center of the town where Johan Hendrik had a substantial art collection. He owned several Rembrandts and Jan Steens, as well as a very extensive library, now in Twickel. His mother, who died very young, had brought Twickel castle into the family and in the summer the family often stayed there. "Thus in addition to their wealth, and their high positions of political power and influence, the family lived in an atmosphere of art and inspiration. 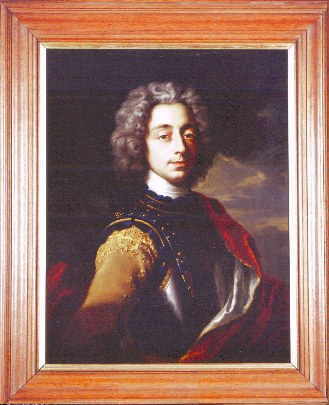 As his elder brother Johan Hendrik never married, Unico Willem inherited the family possessions, though he had to sell most of his brother's paintings. In spite of his musical education and love of music, Unico Willem did not take up music as a career. A number of the Counts at that time had been in the diplomatic corps; Unico became a diplomat in succession to his elder brother, and was active from the 1720s onward in high military, commercial and diplomatic positions, well respected in France both as diplomat and as musician." It is believed that Unico Willem composed his concerti armonici in The Hague where he could play them with his friends, including the Italian violinist/publisher/impresario Carlo Ricciotti (c1681-1756), and his friend and the dedicatee of his concertos, Count van Bentinck (1704-74). Ricciotti was also known as Charles Bachiche, and was nicknamed Bacciccia. Working in The Hague, Ricciotti belonged to a French opera company there from 1702 to 1725, eventually becoming its director. In 1740 he was granted a patent to print six concertos which, though published anonymously, we now know to be the Concerti Armonici of Unico Willem. Later, in 1755 they were published by the London printer-publisher John Walsh who, being no doubt of the opinion that anonymous concertos weren't sufficiently commercial, took it upon himself to attribute them to Carlo Ricciotti, thus adding to latter-day musicologists' confusion! "Unico Willem's two sons enjoyed the same background and the same sort of education as their father, surrounded by arts and music, and with the benefit of leading music teachers. His son Jacob Jan wrote an opera for his mistress, a French opera singer, based on the text of a very famous lady Belle van Zuylen. It seems Unico Willem was very sad that Jacob Jan did not marry this lady!" After the Concerti were published many friends and musicians guessed the identity of their composer, suggesting that it would not be appropriate for such a person in his position to compose. However art flourished in those days, all the princes and nobility took music lessons and even composed themselves, so to seek the composer's only reason for not being identified we must inevitably return to his personal reticence and humility. As the composer himself wrote: Some of them are tolerable, some middling, others wretched….. Today's listeners may well have other opinions! Note by Michael Meacock, who is indebted to Louise van Wassenaer for her valuable insights on the family history, marked in quotations.